All Time Low have just released a shirt that you have to get, and better yet all proceeds are going to the American Civil Liberties Union. Check out the shirt and where to buy it below! Alex Gaskarth had our wallets ready before it even officially released with this post on Instagram. Coming soon. All proceeds will be donated to the @aclu_nationwide — We believe that ALL people from all walks of life deserve equality and fair treatment in this amazing country. We must continue to fight. A special thanks to @andrewstephencook for designing this with me. Stay tuned, stay hopeful. We love you. Drummer Rian Dawson also showed off the shirt on his Instagram as well. Fall Out Boy is also planning to release a special shirt to benefit the ACLU. Taking Back Sunday's John Nolan is working on a special EP to benefit the ACLU. Fighting Back With Music will feature rare or unreleased music from bands such as Anti-Flag, Taking Back Sunday, Frank Iero and Sleep on It with all proceeds also going to the American Civil Liberties Union. The ACLU's mission statement is to defend, uphold and preserve rights and liberties of individuals in this country granted by the U.S. Constitution. PVRIS released a special limited edition shirt, back in November, that was limited to just 250 shirts with all proceeds also going to the organization. Check out what that shirt looked like below. 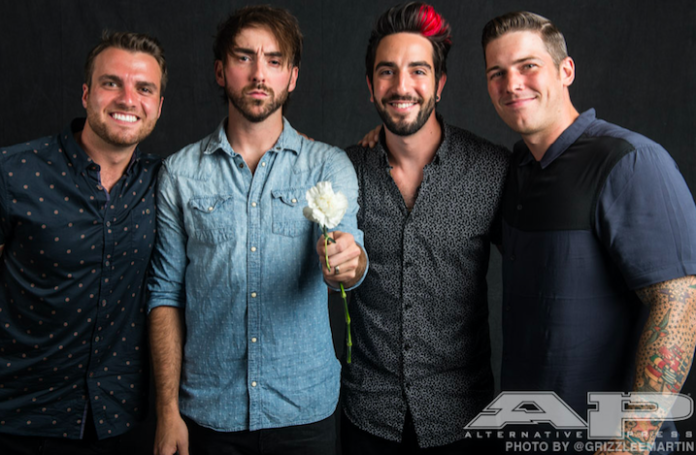 It's clear that President Trump's recent actions have inspired this decision, as both Jack Barakat and Alex Gaskarth have tweeted about the new President. I am an immigrant who was born in the Middle East. Alex Gaskarth helped design the shirt with Andrew Cook. All Time Low has also released a poster featuring the same design. You can buy the amazing new shirt here.